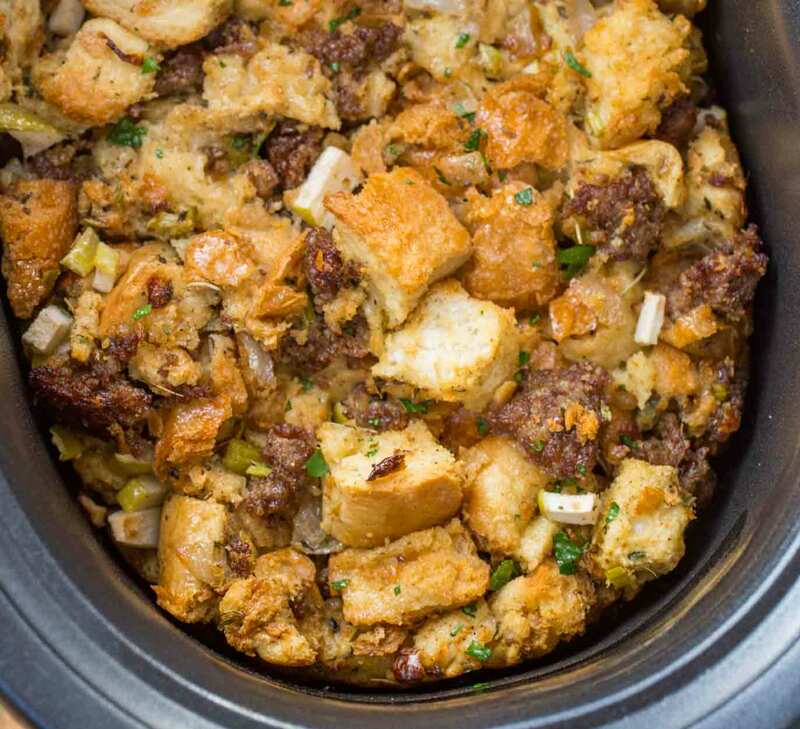 Slow Cooker Stuffing made with celery, onions, bread, and seasonings is a savory side dish and an EASY way to free up valuable oven space this Thanksgiving! 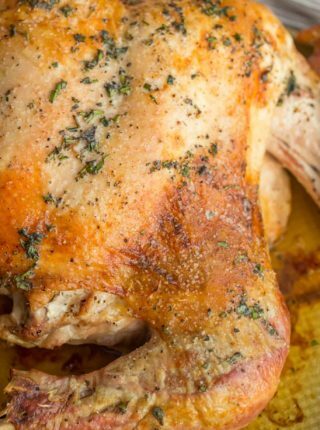 We’re only a few short days away from Thanksgiving, and we’re just about done with our holiday meal prep, including Spatchcock Turkey, Green Bean Casserole, Easy Mashed Potatoes, and Slow Cooker Sweet Potatoes. 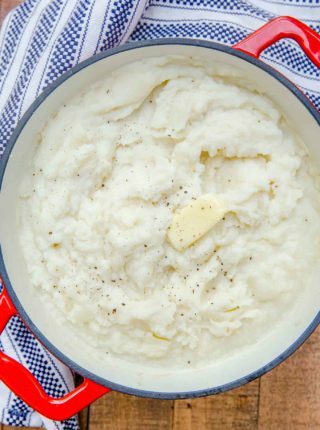 Slow cooker stuffing is a traditional Thanksgiving side dish, but this version is made in the slow cooker to give you room in the oven for more important things. 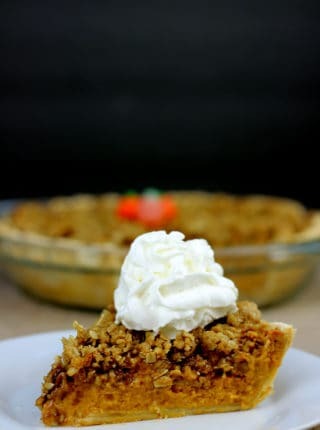 Like this pumpkin pie. Personally, I like to stick to the more traditional stuffing recipes. It’s just what my family has always made, so I have a lot of memories tied to it. We always lean towards the savory side, instead of the sweeter ingredients (except for a bit of sweet from granny smith apples because I’m a sucker for sausage and apples together). Because there’s only a few key ingredients here, this stuffing doesn’t need a lot of prep time. Celery, onions, and sage add the key flavors in this dish, with stale bread cubes giving it texture. Then you just put the lid on the slow cooker, set the total time for 4-5 hours, and forget about it. My favorite part is that you don’t have to watch it as closely as you would if it were in the oven. The edges turn out crispy and the inside is soft and full of flavor. HOW LONG DO YOU COOK STUFFING IN A SLOW COOKER? Set the timer for 4 hours, then check and see if it’s done cooking. If it still looks a little bit uncooked, cook for an additional hour, then remove the lid and cook uncovered for the last 30 minutes. This helps crisp up the top, just like it was made in the oven. CAN YOU MAKE STUFFING AHEAD? You can do a make-ahead stuffing that only has a few quick steps to throw together on Thanksgiving. Mix together the bread and seasoning in one bag, and vegetables in another. Combine everything together with the eggs and broth at the last minute. This keeps the bread cubes from getting too soggy before the stuffing is cooked, and it’s also better for food safety. Another option is to assemble this whole stuffing in a baking dish, then freeze it until you’re ready to cook. 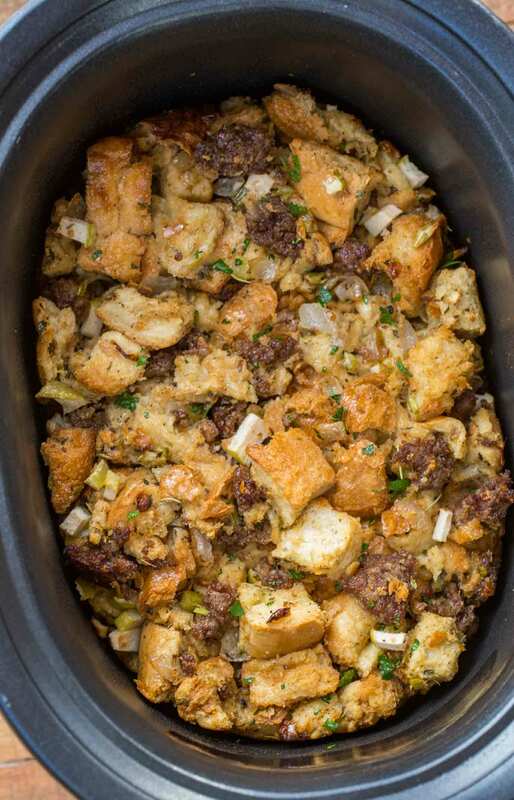 Slow cooker stuffing is easy to switch to the oven if needed. Sauté the onions and celery in a large skillet, while mixing everything else together in a large bowl. When the onions are translucent, stir everything together in the skillet and transfer to the oven. Cook 30-40 minutes, or until top looks golden brown and the sides look slightly crispy. I’ve also made this recipe with day old cornbread in a skillet before. Whichever bread cubes you use, I always recommend having some chicken broth on the stove so you can continually give the stuffing moisture as needed, because the oven tends to dry it out. Leftover stuffing will keep in an airtight container for 3-4 days in the refrigerator, or up to 3 months in the freezer. HOW DO YOU MAKE TRADITIONAL STUFFING? 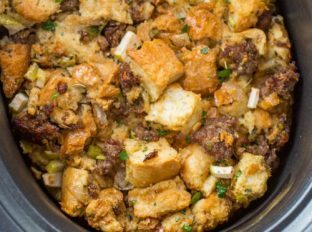 Traditional Thanksgiving stuffing uses a few simple ingredients, bread, celery, onions, and spices. But you can also add fresh herbs, dried fruits like raisins or dates, nuts, apples, or even meat like Italian sausage or roast pork. Stuffing is usually cooked inside of a turkey in the oven, but our aim is to make life easier so we are using the crock pot. WHAT IS THE DIFFERENCE BETWEEN STUFFING AND DRESSING? Stuffing and dressing are actually really similar in that they have the same ingredients. But stuffing is what is actually stuffed inside of the turkey, while dressing is made in a separate dish outside of the bird. Most people use them interchangeably on Thanksgiving, so don’t spend too much time worrying about it. You can add additional ingredients like raisins, cranberries, or apples, depending on your own taste. 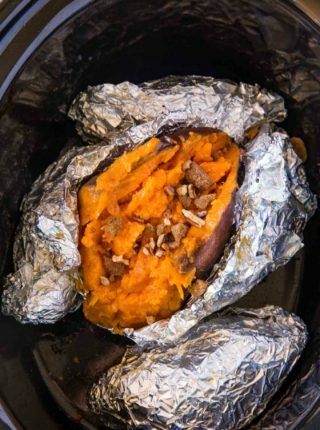 Use a crock pot liner, and the only cleanup you’ll have to do is throwing away the bag. So you can spend Thanksgiving eating instead of cleaning! If you don’t have regular bread, you can use day-old cornbread to make stuffing, too. Have some broth on the stove when the dressing is done cooking. If it dried out at all, add some broth to the crock pot by the ladle full until it is a good texture again. This is more important if you’re baking it in the oven, but it’s good to have just in case. Layer stuffing, cranberry sauce, turkey, and gravy together on the day after Thanksgiving to make a leftovers casserole! Just bake at 350 degrees F until everything is warmed through. In a large pot add the butter, onion, celery, salt and pepper and cook on medium heat for 3-4 minutes before turning off the heat and adding in the broth, poultry seasoning, sage and eggs, whisking together until combined and no extra liquid is sitting in the bottom of the slow cooker (this is important to have it cook evenly). Add the bread to the slow cooker and pour over the egg mixture, tossing together until well combined. Cook on low for 4-5 hours then uncovered for 30 minutes on high. If I double the recipe do I need to increase the cooking time? Yes, probably by an hour. Enjoy! This stuffing looks really amazing! This is the most perfect looking stuffing! So easy and delicious! Can’t wait to try this out! These are gorgeous! I will definitely have them on my table, perfect for holidays! Looks like a delicious recipe for my slow cooker! I’m all about using my slow cookers as much as possible during the holidays. So much easier and frees up my oven. Such a lifesaver to be able to make it in the slow cooker and use less of that precious oven space! Total comfort food for sure.